IC 2631 (Ced 112) is a brilliant blue reflection nebula surrounding the young star, HD973000, about 500 light years distant in the southern constellation of Chamaeleon. As can be seen in the image above, the Chamaeleon cloud complex is a large region of gas and dust where new stars are forming. �The dust partially or nearly totally obscures the stars within and behind it. �HD973000 is a T Tauri star, the youngest visible stage for relatively small stars. �Eventually they will lose mass and shrink but for now they will spend billions of years as a main sequence star. 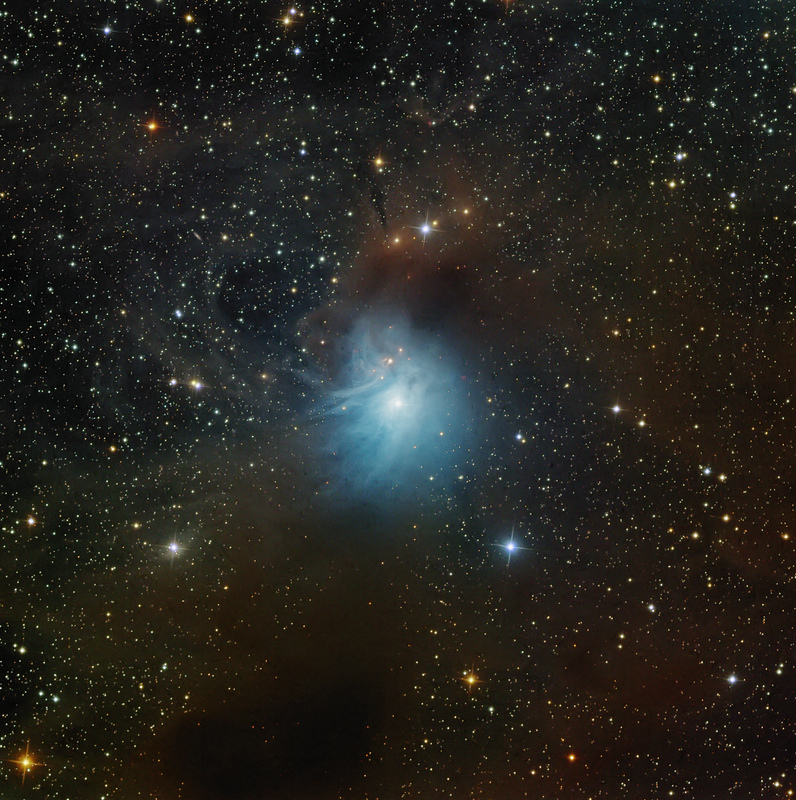 �The image shows the complexity of the dust cloud surrounding the bright reflection nebula. Absolutely stunning! It looks like a tranquil watercolour painting on a cosmic scale! You can even see some Herbig Haro objects and the background galaxies hiding in the dust are a nice bonus. I have a question, what is synthetic luminance and why didn’t you take regular luminance? Impressive! especially the fine detail in the reflection nebula. I understand that your synthetic Lum is a mix of RGB, but I am also curious about the reason not to take directly Lum, that might have shown more info. It is my understanding that the LRGB method involved unbinned, high-resolution luminance, which is then colored by shorter, lower-res, binned RGB color data. I’ve primarily used short, unbinned RGB color data to provide realistic color in my narrowband images. Stars produced solely from narrowband filters can look terrible. I take the color data unbinned so the stars are a better match in size and the exposures, typically 5 min., are short enough not to get much of the nebula. The RGB data for this image is deeper, 10 min exposures and several hours of them. So, the resulting color data is much deeper. So, combining the master RGB data into a synthetic luminance makes good use of the time already invested without having to take hours of luminance data separately. You can deconvolute the synthetic luminance and use other techniques, like high pass filtering, luminance masking, etc as you would with a real luminance. Then you colorize it with the unbinned color. In short, it seems to save time. I may be wrong from a purely mathematical perspective, but it seems to work.